Can you TDD in Scratch? In our team, we use a Test-Driven Development (TDD) approach when writing code. I’m a supporter of this approach and its many benefits. I won’t go into the benefits here — you can Google many articles on the subject (other search providers are available). 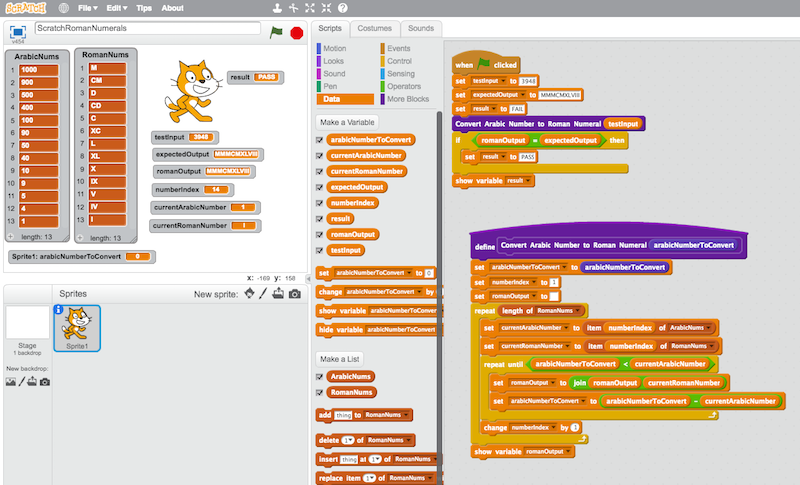 Scratch, from MIT, is essentially a visual programming environment that “helps young people learn to think creatively, reason systematically, and work collaboratively — essential skills for life in the 21st century”. There’s a growing movement around teaching kids to code, that will hopefully play an important part in solving the skills and diversity shortages our industry has. One day, the crazy thought popped into my head: “Can you TDD in Scratch?”. I did a brief Google, and couldn’t find any examples of TDD in Scratch. So, in my “10% time”, I looked into doing some TDD in Scratch. For my first experiment, I implemented the algorithm for the Roman Numerals Kata. I cheated a little here, by implementing the algorithm first and then put a test around it afterward (this isn’t TDD!). This is a quick post in response to a question related to my boiler control Github project: https://github.com/rossharper/boilercontrol I intend to eventually perform a more comprehensive write-up of this whole project. Britain has seen its first covering of snow over the last few days, along with all the overreaction, complaining, and infrastructure meltdown that comes with even the lightest spinkling of water crystals this little island receives. Our nation seems ill-equipped to deal with the rare and irregular arrival of the white stuff, and handles its effects comedically poorly compared to some of our Scandinavian neighbours and Canadian cousins, who are well experienced in dealing with winter-long coatings. Regardless, I love the snow. I’m always delighted by the transformation it makes to the landscape. News broke that Jim Marshall, founder of Marshall Amplification, passed away this week. His iconic brand of guitar amplifiers have been used by many of the most famous guitarists around the world, and they have inspired many a teenager. I had half an hour to spare before heading to the pub on Thursday night, so I knocked together this small tribute. Friday saw Queen Elizabeth II and the Duke of Edinburgh visit MediaCity:UK in Salford to officially open it, as well as BBC North. After a tour of the studio facilities and a visit to BBC North’s Quay House to see some of Research & Development’s current projects, she also presided over the start of the MediaCity:UK 2012 Sport Relief Mile. I got the chance to go to Amsterdam for a couple of weeks back at the end of October last year. I’d been a few years before for a weekend, but I wasn’t really into photography back then and had other distractions. This time, the trip was for business, to do some work on-site with a supplier, and I had a spare weekend to get out and take some photographs of the city.